Eat at home and conserve...benefit number three of eating in. Ben Franklin did more than fly kites, one saying that is attributed to him is "waste not want not"...exactly what you get when you eat at home using leftovers and reducing the amount of food that sees your garbage can or garbage disposal. The green aspects of maximum utilization of our food resources also comes into play when you turn last night's dinner into today's lunch. My definition of a no-brainer. The first benefit is the money that you will save. The more meals you can get out of a single purchase will lower your grocery bill..."a penny saved is a penny earned", cannot be attributed to Benjamin Franklin... that is a Scottish proverb... at least according to Google, and who wants to argue with mother Google? The more ways you make saving money while shopping a habit the more money that you're going to have to spend on the things that you really enjoy. 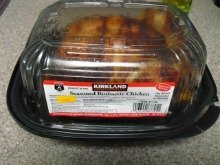 Costco chicken is one of our favorite ways to stretch our grocery dollar... the five dollars that my frugal wife spends on her weekly shopping run enables us to have at least four meals. She shops on Thursday so I know Thursday night's dinner is going to be Costco chicken rice and salad... the next meal might be a salad with chicken strips... perhaps a sandwich with chicken meat... then the chicken meat with a pasta side. I specialize in consumption rather than food preparation. One night a week I can plan on having chicken breasts, with the bone, always very plump...my frugal bride buys these when she can pick them up for $.99 a pound... they are almost always available in the freezer. 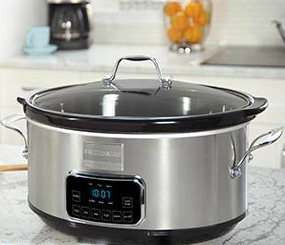 When eating at home... your crockpot should be utilized frequently... we use ours for making the soups and stews... and also making a weekly batch of rice. That crockpot full of rice can be used, for many many meals during the week. Hopefully all of us have a working freezer... in combination with using a vacuum sealer, you are well on the way to conserving your money by not wasting food. Occasionally one of our local supermarkets, will have filet mignon on sale for seven dollars a pound if you buy a 5 to 8 pound tenderloin... the butchers will trim it up, the scraps go to make great hamburger, and the filets are cut to whatever thickness you enjoy. At our house, we vacuum seal two filets at a time, that's a Saturday night treat we always look forward to. You now our armed with all the knowledge that you need to take advantage of the conservation benefits of eating your meals at home... enjoy the savings.